McDonald's is proud to be situated on Maidstone Road, a 1.69 mile distance north-west from the centre of Swanley, in Orpington (near to Hillside Nursery). This restaurant is a beneficial addition to the locales of London, Joydens Wood, Swanley Town Centre, Upper Ruxley, North Cray, St Paul's Cray, Foots Cray and St Mary Cray. If you plan to swing by today (Friday), its hours of business extend for 24 hours. Working hours, restaurant location and phone number for McDonald's Swanley can be found here. McDonald's is situated in an ideal space right near the crossroads of Old Maidstone Road and Maidstone Road, in Orpington, Swanley. Only a 1 minute drive from Cookham Road; a 4 minute drive from A20 / Sidcup By-Pass, Edgington Way and North Cray Road; and a 9 minute trip from Sevenoaks Way and Sidcup Hill. There are a number of buses that run to and from Hillside Nursery and Old Maidstone Road. Conveniently available along the line: 233. The tube operates regularly to and from Croxley Station (1.59 mi away). The line to travel here is the Metropolitan. Trains travel every day to and from Swanley Station (1.59 mi), Albany Park Station (1.97 mi) and St.mary Cray Station (2.08 mi away). Accessible via the line: Southeastern. Around this restaurant you may visit Swanley Park, North Cray Churchyard, Swanley Full Gospel Church, Orpington Golf Centre, Birchwood Park Golf Course and Pembroke Business Centre. McDonald's runs 1 existing restaurant in Swanley, Kent. 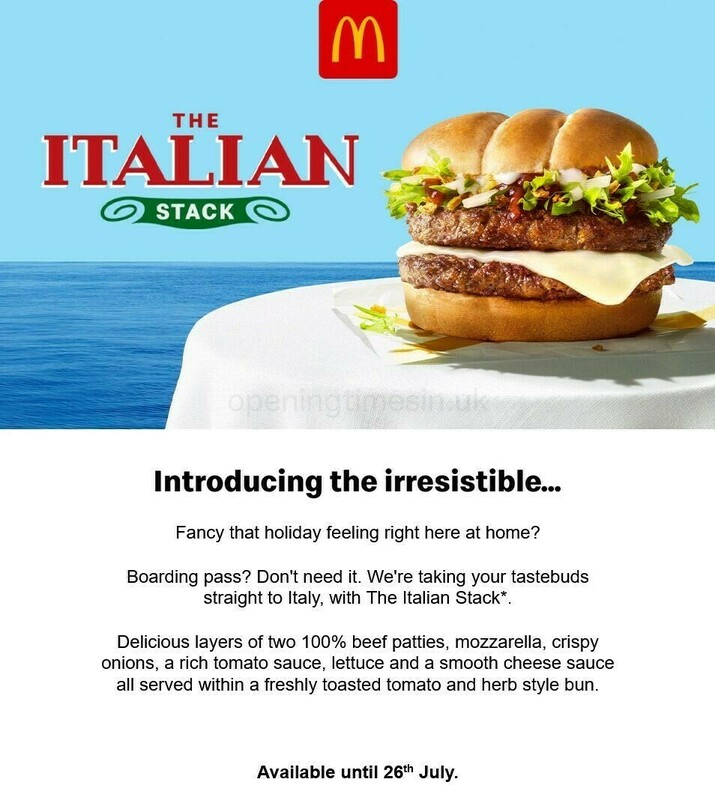 Click here for the entire index of all McDonald's locations near Swanley. Please note, usual opening times for McDonald's in Swanley may shift during legal holidays. For year 2019 these changes consist of Xmas Day, Boxing Day, Easter Sunday or August Bank Holiday. For more info about the seasonal operating hours for McDonald's Swanley, go to the official site or phone the information line at 370 524 4622. Opening Times in the UK's goal is to deliver you with the most accurate information as possible. In the event that you find mistakes in the address description or restaurant hours for McDonald's in Swanley, please let us know by making use of the report a problem form. Your opinions are beneficial. Please use the box and star rating system provided below, to critique McDonald's.